Acknowledged author Steven L. Emanuel wrote Strategies & Tactics for the MBE comprising 720 pages back in 2016. Textbook and etextbook are published under ISBN 1454873124 and 9781454873129. Since then Strategies & Tactics for the MBE textbook received total rating of 4.5 stars and was available to sell back to BooksRun online for the top buyback price of $20.86 or rent at the marketplace. 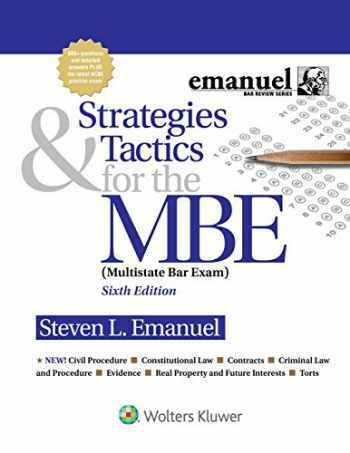 Strategies & Tactics for the MBE, 6E is full of up-to-date advice on how to analyze Multistate Bar Exam (MBE) questions, including details on how to handle each MBE subject, specific, step-by-step strategies for analyzing different question types, tips about how subtle differences in wording can completely change the meaning of an answer, and strategies for "rewording" questions in your mind to make them easier to analyze. Updated by Steven Emanuel, Strategies & Tactics for the MBE, 6E contains a full-length, 200-question practice MBE exam, as well as more than 325 additional questions broken down by subject a total of over 500 NCBE-released questions. The new edition also includes 70 author-generated Civil Procedure questions. Each subject begins with detailed advice on how to handle MBE questions on that subject and how to focus your studies on the most common and trickiest MBE topics. Every question has a fully explained answer that analyzes, in detail, every answer option.Features:Updated to include a comprehensive section on Civil Procedure, which was recently added to the MBE exam. This new section features approximately 70 author-generated questions.For the traditional MBE topics (Constitutional Law, Contracts, Criminal Law and Procedure, Evidence, Real Property and Future Interests, and Torts), every one of the more than 500 questions in this book represents an actual question asked on a past MBE. These questions have been reviewed for accuracy and updated.